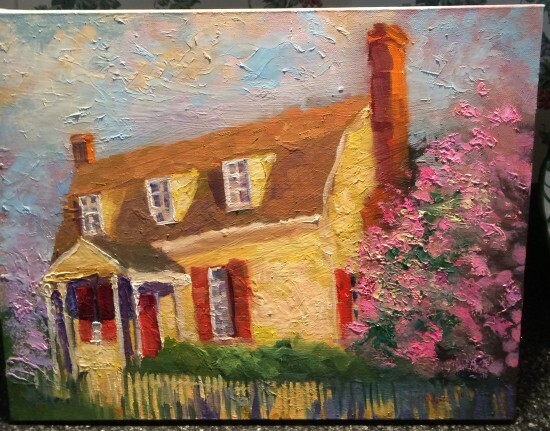 The Colonial Dames are holding a drawing for a gorgeous painting of the JLMH painted and donated by Raleigh painter, Mike Hoyt. The drawing will take place on the evening of May 5. Tickets are $25 each or 4 for $100. To purchase, visit Eventbrite.com by clicking here. The painting measures 19 1/2 ” by 16” and is done in oil on a linen canvas. It is framed in a gold-colored wooden frame. It is sure to be treasured for generations by the lucky winner and his or her family. In the past 15 years, Mike has captured the light, color and emotion of the world as he sees it. He’s mostly interested in everyday things: the sea shore, farms and valleys, dogs and farm animals, wine glasses on a table top, people in bars and restaurants. His paintings are intended not just as representations, but to tell stories and, sometimes, convey emotions. He works quickly and simply, necessities when painting outdoors a lot. He has studied with some of America’s great contemporary impressionist painters: Lois Griffel, Kevin MacPherson, Kim English, Peggi Kroll Roberts, Charles Sovek, to name a few. He takes inspiration from artists of New England’s Ashecan School, Fetchin, Sargeant, Hopper, and many others. He is represented by: the Eno Gallery, the John Silver Gallery, Mahler Fine Art, and the Tyler-White Gallery (all in North Carolina), and Art Access Gallery, in Ohio.